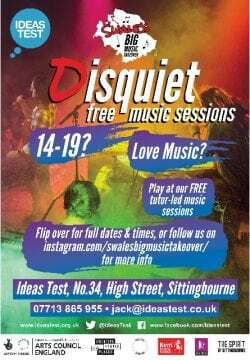 Disquiet is a Swale’s Big Music Takeover project from Ideas Test, for anyone between 14-19. Just come along and play…for FREE! Led by a tutor from Kent Music, you’ll have the chance to learn new instruments, form bands and create live sets with other like-minded young people. You can bring your own instruments, but we have keyboards, guitars, ukuleles and more available for you to use in the sessions. Interested? Disquiet is on between 2pm to 4pm every Saturday until 30th March in Sittingbourne. Please download an application form using the button below. Bring your completed form to your first session. For more information contact Jack at Ideas Test via jack@ideastest.co.uk or by phone on 07713 865955.